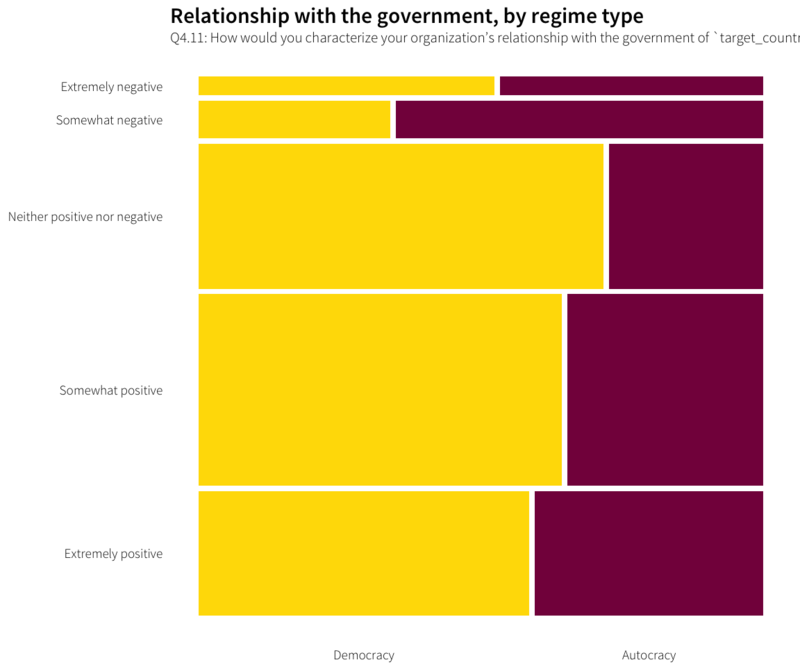 How do respondents differ across the regime types of the countries they work in and the issues they work on? 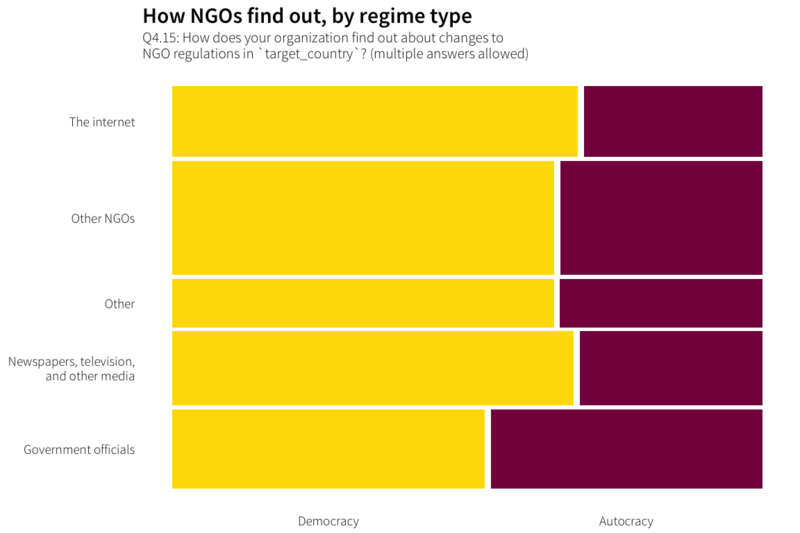 Most NGOs are based in democracies (only 11% are headquartered in autocracies), but a third of them answered questions about their work in autocracies. There are differences in potential contentiousness across regime type. In democracies, a quarter of INGOs work on more threatening issues, but in autocracies, nearly 40% do, which is a lot more than expected. 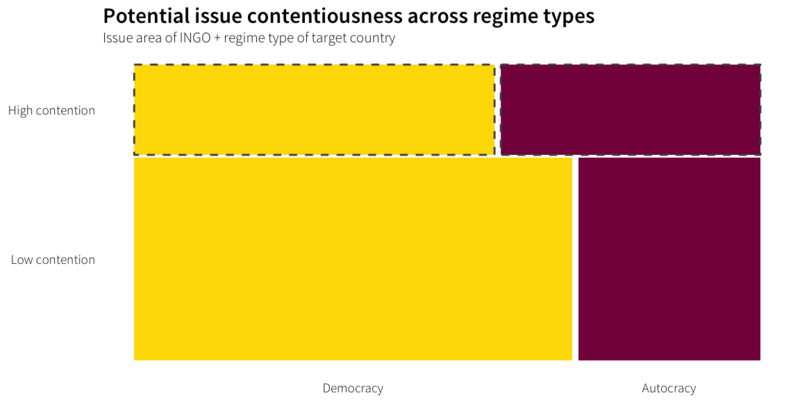 Seen differently, across types of contentiousness, 70% of INGOs working on low contention issues work in democracies, in contrast to 58% of high contention INGOs. This is most likely because autocracies are more in need of high contention issues like human rights advocacy, human trafficking, conflict prevention, and freedom of expression protection. What is the relationship beween feelings of restriction and instrumental concerns? 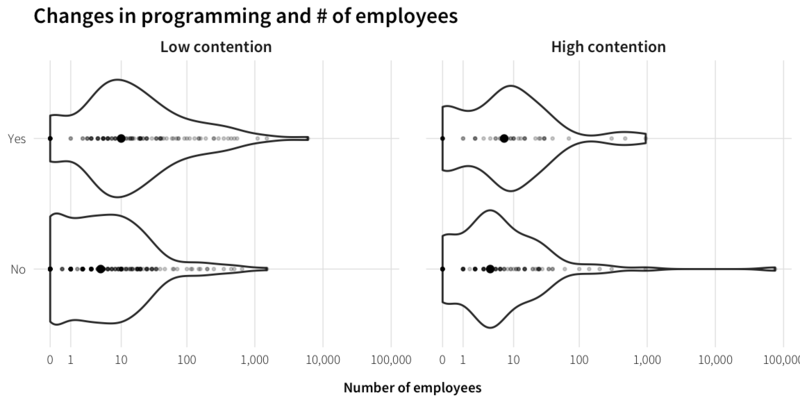 How do respondents working in different regime types and on different issues differ in the distribution of their instrumental characteristics? Do those differences help drive restrictions? ## Warning: Removed 46 rows containing missing values (geom_point). ## Warning: Removed 10 rows containing missing values (geom_point). ## Warning: Removed 8 rows containing missing values (geom_point). ## Warning: Removed 28 rows containing missing values (geom_point). # TODO: Staffing, collaboration, funding, etc. # TODO: Figure out how to deal with org-level regime type analysis, since organizations work in multiple countries and answered only for one. Proportion of countries they work in that are autocracies? For regime-based questions, this analysis is more straightforward, since each country-organization response is limited to a single target country. The questions also deal with the organization’s specific actions in the country, not what they do in all countries. 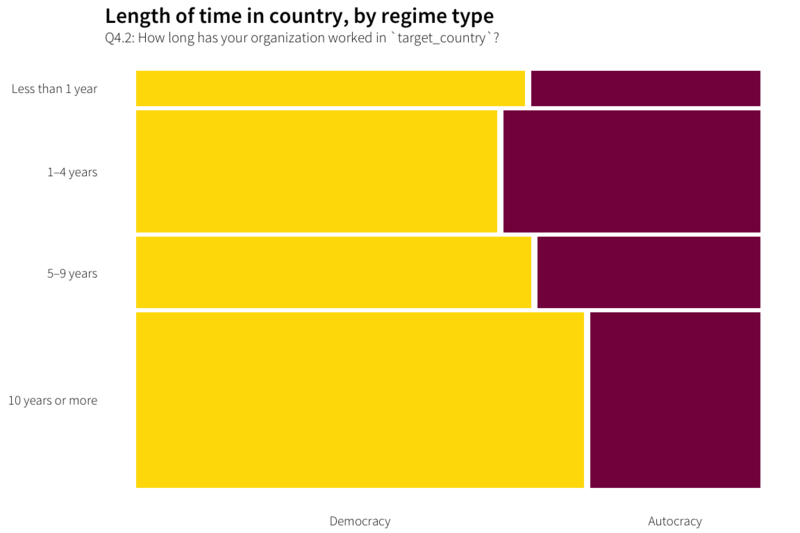 Most NGOs working in democracies have been there for 10+ years, while most NGOs working in autocracies have only been there for 1-4 years, and the differences between time worked in country across regime types are significantly different from expected values. NGOs that work in autocracies tend to have less of a legacy or history of working there, are possibly less likely to have a history of working with the government. NGOs working on low contention issues tend to have worked in their respecitve target countries for a long time. 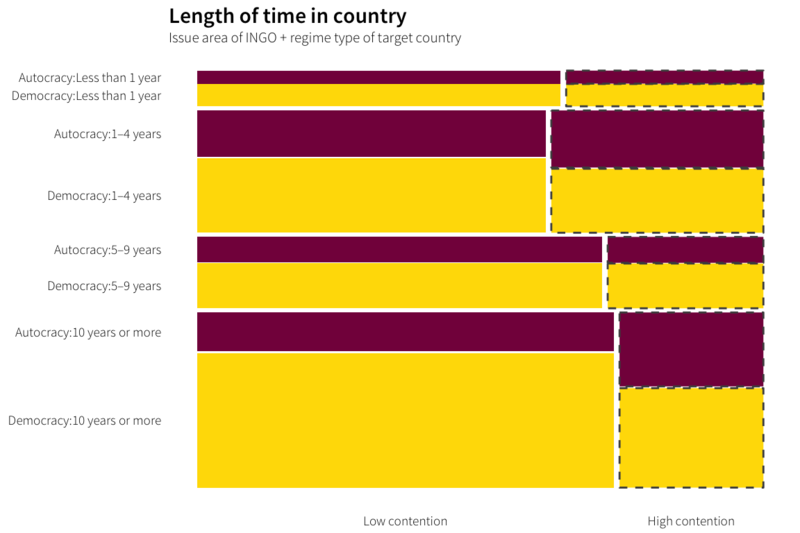 High contention issue NGOs are more than expected / more likely to work in their target countries for 4 years or less. This may be because there’s a burst of more contentious INGOs being allowed, or that more contentious INGOs get kicked out more regularly and can only stay in country for so long. When accounting for both regime type and main issue area, an interesting story emerges. Individually, I found that INGOs working in their target countries for 5+ years were most likely to work on non-contentious issues and work in democracies. Relatively few of the long-term INGOs work in either autocracies or on more contentious issues. This remains the case when accounting for both target-country regime type and main issue area. There are fewer low contention, long-term INGOs working in autocracies than expected and more low contention, long term INGOs working in democracies. NGOs in autocracies definitely pursue different operational strategies. 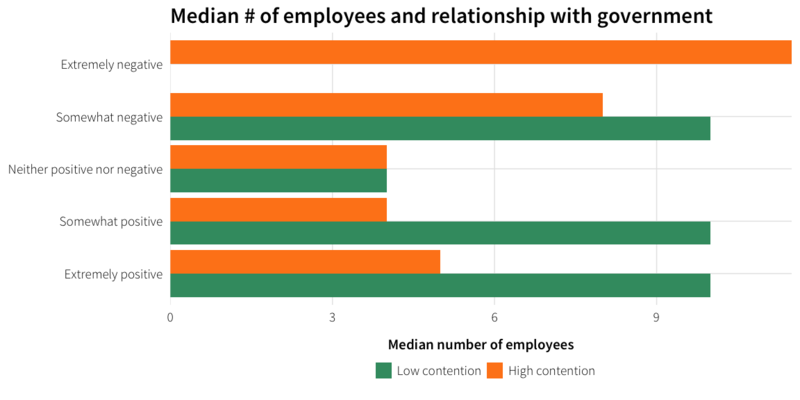 The most common strategy for these NGOs is to provide funding to domestic NGOs, while the least common is to maintain an office staffed by foreigners (difference is statistically significant). International NGOs seem to be more likely to take a hands off approach to advocacy in target countries that are autocracies. 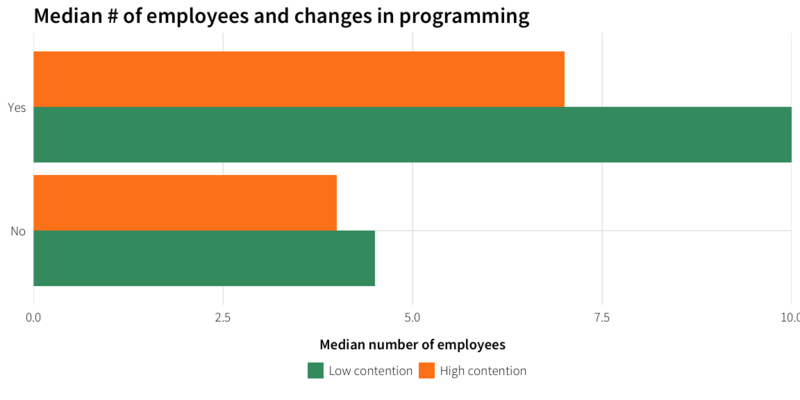 There’s an overall significant difference in frequencies, driven primarily by more high contention INGOs working with foreigners. The individual cell effects, however, aren’t particularly significant. In general, more INGOs than expected use foreigners in their target countries). There’s a slight difference in how NGOs register across regimes, with more NGOs registering in autocracies than in democracies, perhaps because they are more likely to be required to register in autocracies. The difference is not significant, though. There is no significant difference in the registration status of low and high contentious INGOs. There’s a dramatic difference in how NGOs report to the government in autocracies. 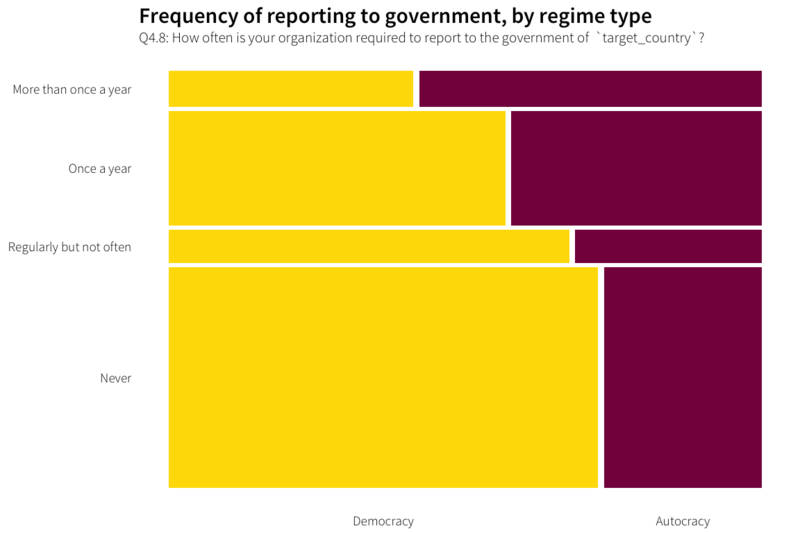 INGOs that work in autocracies report the most often and are the least likely to never report, possibly reflective of stricter reporting requirements. 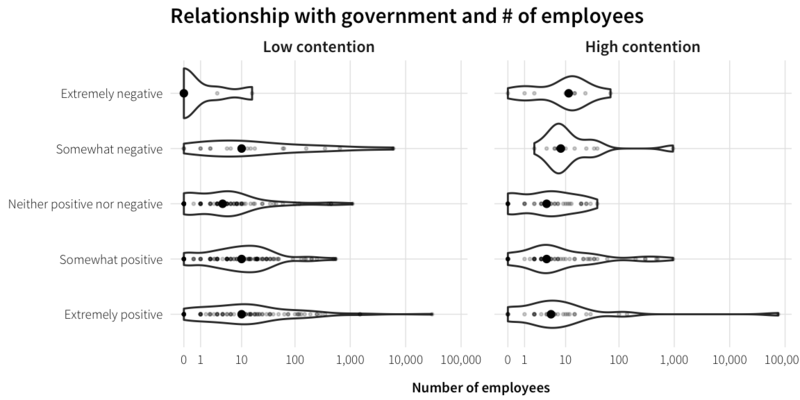 Members of the government aren’t typically directly invovled in INGO work, but when they are, it is more likely to occur with INGOs working in autocracies. Another huge difference. INGOs working in autocracies have worse relationships with their host governments. Most INGOs working in democracies are either moderately familiar with government regulations or not familiar at all. For INGOs working in autocracies, familiarity with regulations appears to be more essential—most are very or extremely familiar with regulations, and very few are unaware of any of the laws governing their activities. The difference in proporitions across groups is significant. Most NGOs don’t know, and I didn’t include an “other” category here. 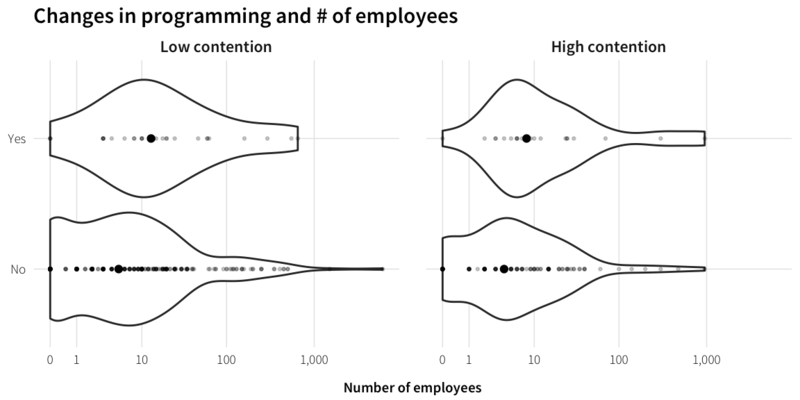 The univariate distribution has a clear trend, with most reporting “Rarely” (and only a few “Never”; “Never” and “Once a month” are collapsed because of low expected values). 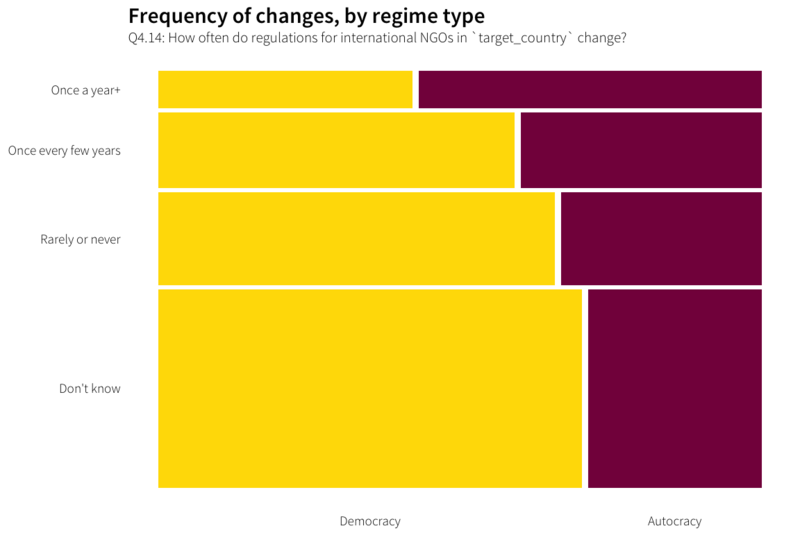 There’s also a trend by regime type—more INGOs working in autocracies see annual changes in regulations, possibly reflecting a more volatile regulatory environment. There’s no difference in the frequency of changes across issue areas, which is to be expected. Actual legal restrictions are a blunt instrument and don’t really target specific sectors of INGOs. How do they find out about changes? INGOs working in different regimes hear about changes somewhat differently as well. 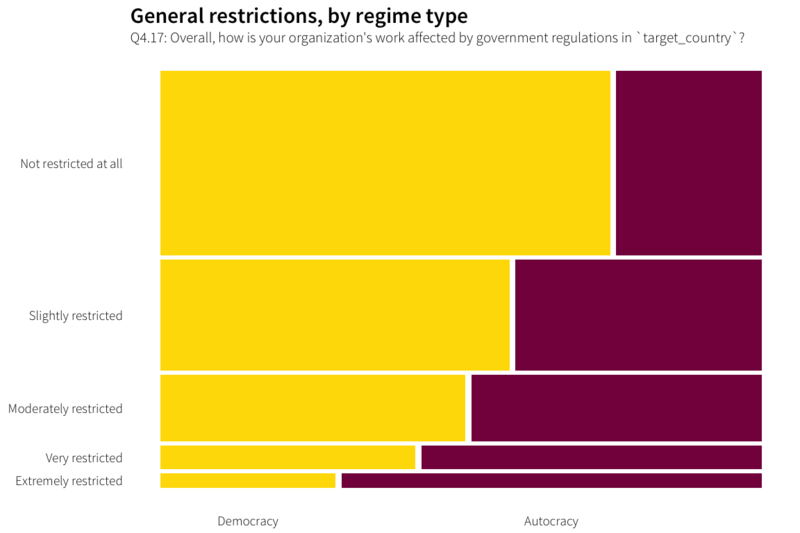 Those working in autocracies are more likely to hear about changes in regulations directly from government officials, while those in demcoracies are way less likely to do so. Other NGOs are the most common source for both regime types, and all other categories are in the same order and roughly the same proportion. This makes sense since INGOs already have more regular contact with government officials in autocracies. 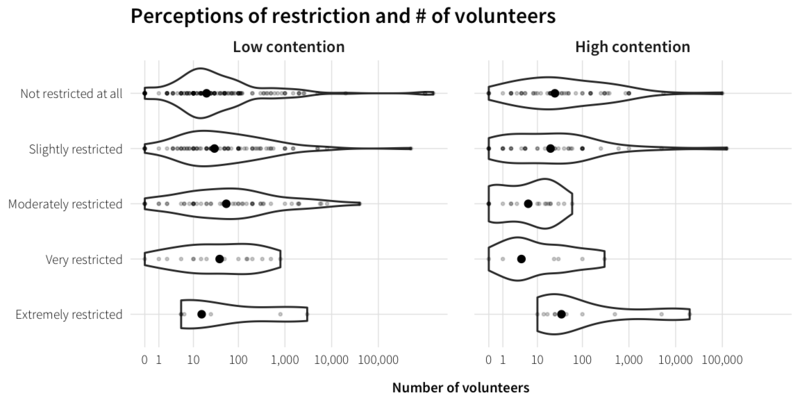 INGOs that are restricted tend to work in autocracies and there’s almost a perfect trend. Differences in general restrictions by issue are less pronounced. There is a significant overall difference, driven primarily by high contention INGOs that report feeling extremely restricted. All levels of restriction are relatively even, following a 65-35 split between low and high contention INGOs. There are more unrestricted low contentious NGOs working in democracies than expected and far fewer unrestricted low contentious NGOs in autocracies. 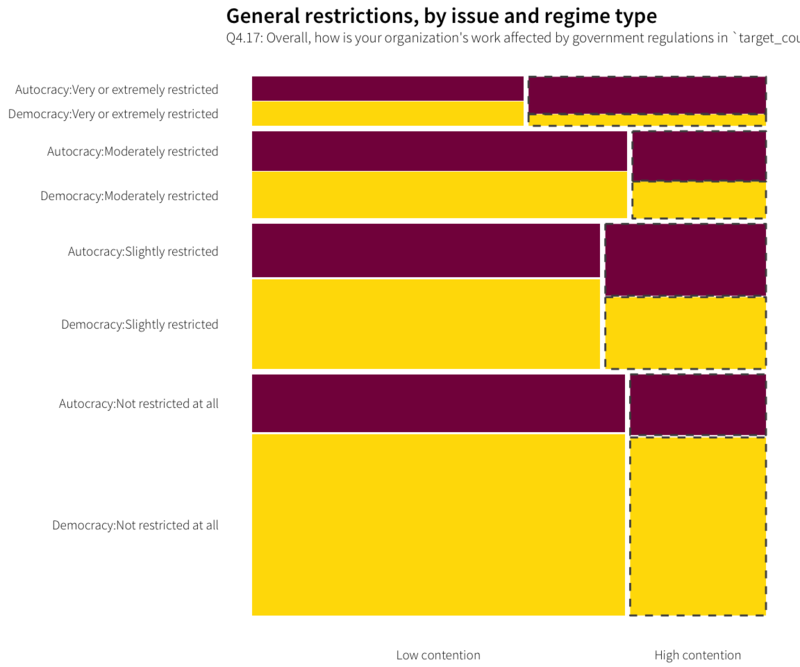 Additionally, there are fewer highly restricted INGOs in democracies (especially high contentious ones), and far more highly restricted, highly contentious INGOs working in autocracies than expected. Slightly more NGOs that work in autocracies have changed their programming in the past decade, but not in a statistically significant way. In general, most INGOs have not changed much, and the split is proportional across regime type. 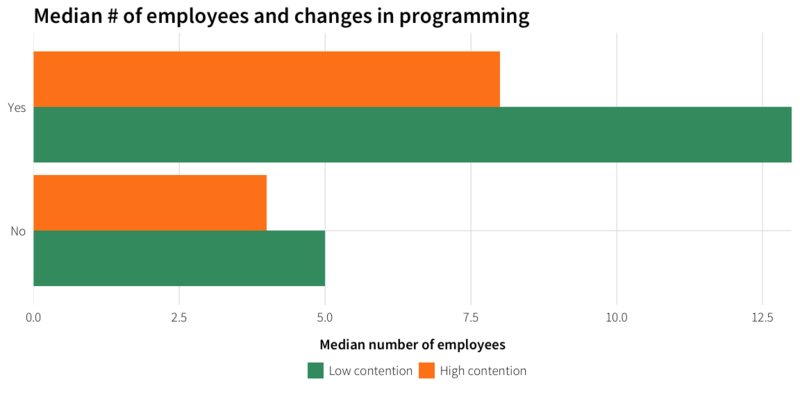 Slightly fewer INGOs working on highly contentious issues have changed their programming over the past decade, but again, the difference between expected and actual is not significant. # Use diff for the two column effect! INGOs working in autocracies are far more likely to have discussed NGO regulations with their host governments—the majority actually have (54% of those responding “yes” work in autocracies; 32% of those working in autocracies responded “yes”), and the difference is statistically significant. This is likely because INGOs working in autocracies have more of a reason to discuss the regulations, as they see more regulations in general. There’s no difference across issue areas in whether or not an INGO discusses regulations with the government—the same proportion (66% haven’t discussed; 20% have; 10% don’t know) holds across both levels of potential contentiousness. 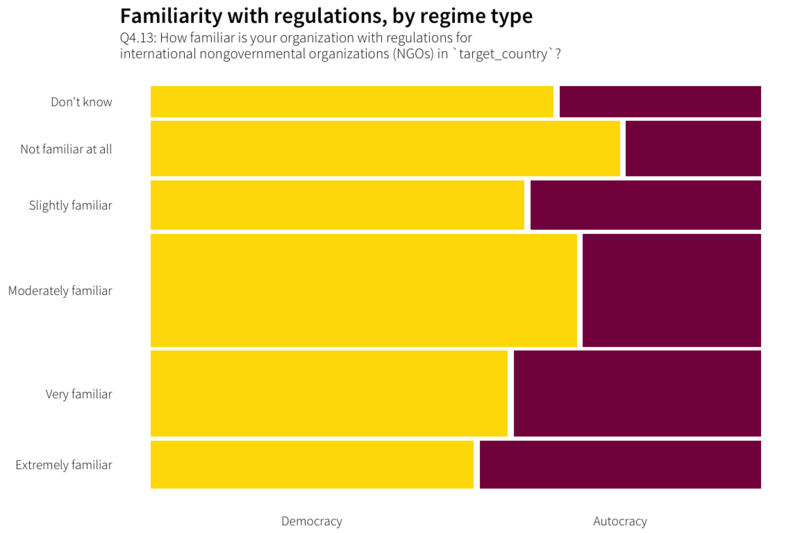 Most INGOs don’t attempt to change regulations, but those that do are most likely to work in autocracies (and the difference is significant). 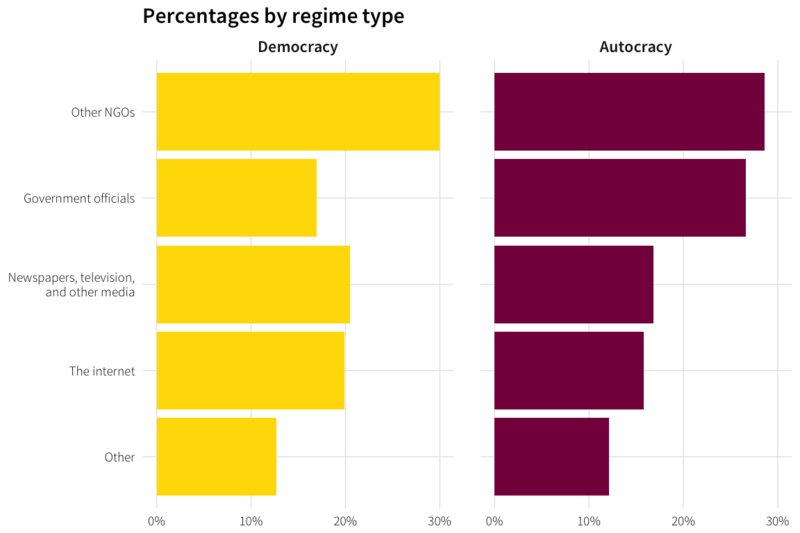 Additionally, only 8% of INGOs working in democracies have attempted to change regulations, while 16% of those working in autocracies have, despite the fact that the legislative process is much more difficult to navigate in autocracies. INGOs appear to be more likely to engage in the political process to adjust regulations despite these challenges. There’s also a difference across issue area. 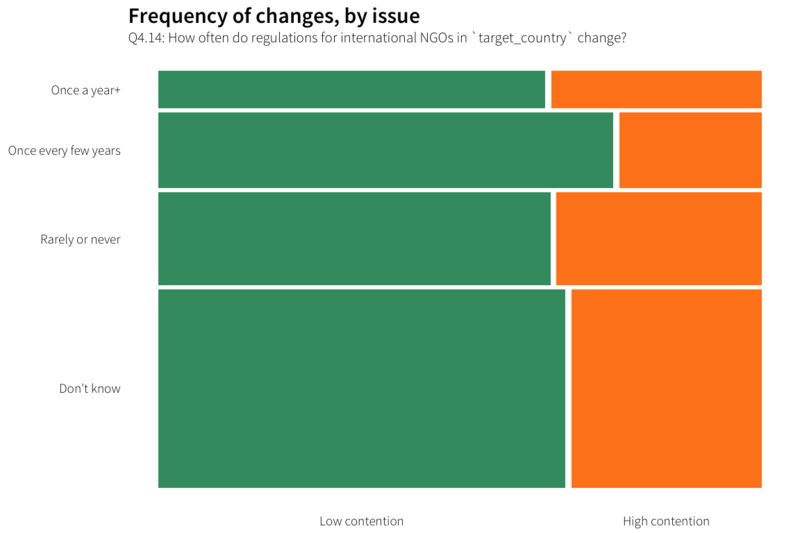 INGOs working on highly contentious issues are more likely to try to change regulations, similar to regime type. The difference is statistically significant overall, but is not driven by a single significant cell (though yes + high comes close). If an INGO does not make one of these three adjustments—shifting its ideal point, increasing its operational flexibility, or becoming essential for the regime—it runs a high risk of expulsion.